Guest Post: DIY Pool Party! 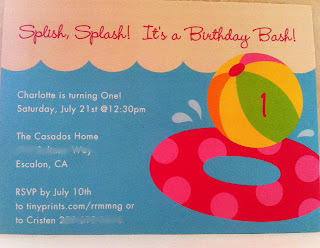 Here are a few projects from my daughters 1st Birthday Party! I bought a #1birthday candle at the Dollar Tree. I used some Swarovski crystals to decorate it a little bit and some paint to add some more color to the edges. A little trick I learned is to shove a toothpick about halfway into the bottom of the candle to get it to stand better in the cake. Goody Bags: Beach buckets filled with stickers, toys, games, bubbles...etc. A Teddy-Graham floating in a blue Jell-O "pool" in a gummy Lifesaver. Everyone loved these! These Push-Up pop cupcakes were also a hit! We used funfetti cake, strawberry cake and lemon cake and added "electric" food coloring gels to each batch to get these bright colors. To get the cake to be thin enough for the push-ups we baked each color in cookie sheets. The thickness was perfect. I added white sand (Dollar Tree) to the bottom of a tall vase and threw some mini beach balls in it for some extra decor around the house. 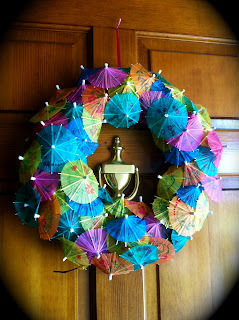 Drink umbrellas shoved in a grape vine wreath for the front door. Special thanks to Tight Wad in Utah for allowing me to guest post! What is that the cakes are in? They are push-up pop containers. We got them at our local cake shop but you can order them online at Amazon.com, bakedco.com, save-on-crafts.com and lots more sites! They are completely reusable, too! Those push pop cake containers are amazing!